I recently watched an episode of America's Test Kitchen where they made an Antipasto Pasta Salad. I loved their technique and how they used the dressing to marinate and cook mushrooms. Although, I didn't use mushrooms in this recipe, since I forgot to buy them, (ugh! ), I still want to try their method of cooking them right in the dressing. They made a dressing of red wine vinegar, EV olive oil, mayonnaise, some juice from a jar of pepperonicinis, and spices. They bring a small amount of this dressing to a simmer in large skillet over medium-high heat and cook the mushrooms until they release their juices and are lightly browned or about 8 minutes. Doesn't that sound delicious? Who would have thought of cooking mushrooms in a dressing? I think I am going to try making mushrooms like this soon, just for a side dish. Anyway, I lightened up their recipe and decided to make it a warm dish. Since the weather was still sort of cool in the New England area, I wanted something that would warm me up. But it can easily be served at room temperature or cold as well. You can use what ever cheese you have on hand and also play around with the meats as well. I chose turkey because it is so light, but even chicken or ham would work here and still be light. In a medium bowl, whisk together vinegar, olive oil, mayonnaise, pepperoncini juice, garlic, red pepper flakes, 1/2 teaspoon salt and 1/4 teaspoon pepper. Transfer 1/3 cup of dressing to a separate small bowl and set aside. In a medium sauce pan, steam or boil broccoli for about 5-6 minutes, or until crisp tender. Drain and add the 1/3 cup of reserved dressing to the same pot, bring to a simmer and toss in the broccoli. Cook on low heat for 2 minutes, stirring constantly. Transfer to large bowl. Cook pasta according to package instructions or until al dente. Drain pasta, return to pot, and toss with remaining dressing. 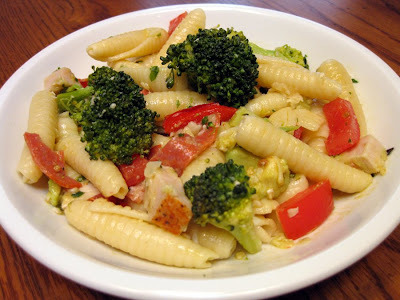 Add turkey, turkey pepperoni, cheddar cheese, roasted red peppers, avocado, parsley, and pasta to broccoli and toss well. Season with additional salt and pepper. Serve at warm or at room temperature. Salad can be refrigerated for up to 3 days. Wow, this recipe sounds great! Sorry you forgot the mushrooms--I do that kind of thing all the time, but the dish looks fabulous without them! This looks so delicious and light! That's an interesting type of pasta you have there. It's cold here today, too. Might snow! And I'm in southern MO. Great color in this dish. Looks very tasty! love this... light and healthy! All the new recipes sound mouth watering!! This is great Annie,great presentation and the pasta salad is delicioso,bambola.